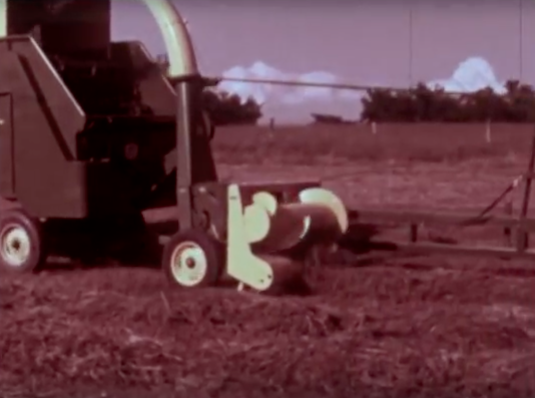 This video is a great testament to not only how advertising and commercials have changed, but also how farming has changed since the first John Deere 34 Forage Harvester model. The 1967 model featured a 6-knife cutter head for cutting and throwing. A knife sharpener with a tungsten carbide cutting edge was included to sharpen the cutter heads and increase their lifetime. The length of the cut was largely determined by the number of knives on the cutter head and the speed of the feed rolls. You could change the speed of the feed rolls by changing the sprocket or reduce the length of cut by simply pulling a pin and sliding a shaft in or out depending on the desired length. The crop-handling attachment and the feeding mechanism would pivot on this model, which at the time was a John Deere exclusive. The commercial boasted that the pivoting action provided more capacity, uniform feeding, and simple pin joints to fasten the attachment to the machine. Other attachments available included a 6-foot mower bar and varying length stalk guides. John Deere forage harvesters have improved vastly in the years since their creation. Today, many are equipped with features like Active Fill Control technology, precision ag capabilities, and best-in-class cabs for operator comfort. If you have questions about forage harvesters, contact your local John Deere dealer.